The Wilmington Area Planning Council takes an objectives-driven, performance-based approach to its metropolitan transportation planning, including paying special attention to integrating its Congestion Management Process into its planning efforts. The agency benefits even more because of its close working relationship with the region's primary public transportation provider – making transit a true partner in the regional planning process. In keeping with this partnership, the agency uses detailed transit data as one of the performance measures it uses to define congestion and relies upon a toolbox of solutions that includes transit options. The agency closely monitors the transportation system and tracks project effectiveness, reporting annually. To date, crash data has been incorporated into its congested corridor identification process, and future steps include enhancing coordination with regional partners and improving the assessment of the true costs and benefits of transportation improvements. The Wilmington Area Planning Council (WILMAPCO) is the regional transportation planning agency and Federally designated metropolitan planning organization (MPO) for New Castle County, Delaware and Cecil County, Maryland. WILMAPCO's nine-member council is made up of representatives from the Delaware and Maryland Departments of Transportation (DOT), the Delaware Transit Corporation, the Office of the Governor of Delaware, New Castle and Cecil counties, the City of Wilmington, and municipal representatives from the counties. The Wilmington metropolitan region lies immediately between two larger urbanized areas – the greater Philadelphia region to the north and Baltimore to the south (see Figure 1). Figure 1. 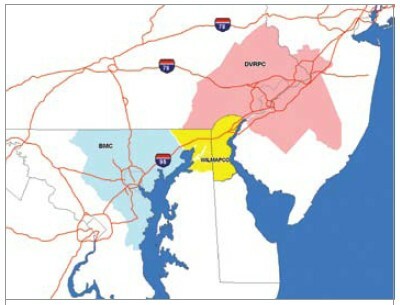 WILMAPCO planning region and its neighboring regions of the Delaware Valley Planning District Commission (DVRPC) and the Baltimore Metropolitan Council (BMC). In comparison to its neighboring MPOs, WILMAPCO is responsible for a relatively small region, only 744 square miles with a population of just over 625,000 people. Likewise, the Wilmington region has not experienced the growth of some large urbanized areas. Over the last decade, growth in households and jobs has slightly outpaced the 9.7 percent growth in the region's population. This is due to a healthy regional economy and small household sizes. When it comes to transportation though, WILMAPCO is encountering growth challenges similar to large MPOs. Regional increases in trip length and vehicle miles traveled have far outpaced the 4.4 percent increase in lane miles. Moreover, despite robust bus and rail service options available for commuters, especially those in more densely populated New Castle County, the percentage of WILMAPCO residents choosing to commute via transit has held constant from 1990 numbers. The continuing trend toward smaller household size means that more households are generating more trips from more locations. Since capacity increases cannot keep up, the result has been longer and more congested trips taken in the Wilmington region. Recognizing that traffic congestion poses a problem now and into the future, WILMAPCO builds upon the foundation it created in earlier plans with its adopted Regional Transportation Plan (RTP) 2030. The RTP 2030 takes an objectives-driven, performance-based approach in its metropolitan transportation planning. Similar to years past, WILMAPCO pays special attention to integrating its Congestion Management Process (CMP) into its transportation planning process. WILMAPCO also continues its close partnership with public transit during the planning process and other coordinated efforts. The RTP 2030 is objectives-driven and performance-based. The plan is organized around three main goals and a series of objectives that are designed to address current challenges. For each objective, a number of actions are identified to guide WILMAPCO and its member agencies over the next several years. The goals that guide the direction of the RTP 2030 are: (1) support economic growth, activity, and goods movement; (2) efficiently transport people; and (3) improve quality of life. Each goal is clarified by general objectives (see box below), which in turn are carried out through a series of specific actions. The attention given to transporting people in the RTP 2030 is on purpose. Since 1996, when WILMAPCO adopted its first truly comprehensive long-range plan, the agency has had a strong partnership with the region's primary public transportation provider, the Delaware Transit Corporation (DTC). DTC has become particularly influential in the regional planning process. Promoting transportation alternatives is clearly stated as an objective in the RTP. To achieve this objective, potential actions listed include planning and funding multimodal projects, increasing access to transit, and funding strategic improvements to the region's transit system. In addition to goals and objectives, WILMAPCO continues to use regional performance measure indicators, detailing relevant trends that help track the progress of each of its actions. The agency compares data from these indicators with set performance targets. These targets are established by the agency and may use national averages. The comparison allows WILMAPCO to identify knowledge gaps between regional transportation policies and actual conditions, and then target needs for additional resources. The performance-based approach taken by WILMAPCO in the RTP 2030 extends to its approach to addressing congestion in the Wilmington region. The agency applies a four-step Congestion Management System (CMS) approach that focuses on the core functions of a CMP. While WILMAPCO retains the name CMS, its approach embodies current CMP elements. Figure 2. CMS integration into the planning process. Data for these measures is provided by Delaware DOT, University of Delaware Center for Transportation, and DTC. In keeping with its close coordination with transit, bus load factor data is provided via a point-based travel survey conducted by DTC. The data is broken down by road segment and transit stops are combined to give an average transit ridership load factor along a given road segment. WILMAPCO reviews the use of congestion measures annually, placing priority on acquiring regularly occurring or fresh data, not modeled data. For instance, in Delaware, developers are required to perform traffic impact studies which gather current intersection level of service. Once completed, this data is provided to WILMAPCO to feed its intersection GIS database. Using these performance measures, WILMAPCO and its CMS subcommittee identify the most congested corridors. They then determine mitigation measures that are most appropriate for each corridor. A "toolbox" of solutions for each corridor is considered, including measures involving all modes of transportation, as well as encouraging efficient patterns of land use and development. The outputs of this stage (i.e., identified locations of congestion and recommended congestion mitigation measures) then flow into the Delaware DOT project pipeline and the Maryland State Highway Administration Highway Needs Inventory, where they are included in the WILMAPCO RTP Aspirations List, an inventory of needed but financially constrained projects. Projects included on the Aspirations List are then evaluated during the project prioritization process for inclusion in the Transportation Improvement Program (TIP) along with other agency capital improvement programs for implementation based on funding allowances. During the prioritization stage, projects are scored against criteria tied to the overall goals of the RTP. Scoring criteria give extra credit for transit-supportive projects. Likewise, if a proposed project is located within an identified congested corridor, its score can be boosted greatly. Projects within a congested corridor automatically receive two points. They are then qualified to receive up to four points if the traffic volumes are high and up to three points if the capacity of the location's fixed-route transit service is too. With 9 points out of a possible 33, congestion relief is the single most heavily-weighted factor in the prioritization process – receiving nearly 28 percent of the weighted distribution. After technical scores are calculated, qualitative considerations may be introduced to adjust a project's final ranking (e.g., urgency of a project, cost-effectiveness, etc.). Selected projects then advance toward implementation. After implementation, WILMAPCO continues to monitor the system and track project effectiveness. The agency produces a regional progress report annually. The document analyzes a series of quantifiable congestion measures that relate back to the RTP. It shows data such as year-by-year tracking of measures, addition of infrastructure that helps alleviate congestion, and transit level of service changes, among other data. With this base of annual data, WILMAPCO is able to identify significant transportation trends (e.g., auto crashes and bicycle/pedestrian fatalities in the region remain higher than the national average, residents in the WILMAPCO region drive more than the average American household, etc.). If areas are found to be lagging behind, mid-course corrections, such as reallocating additional resources, are implemented to remedy the situation. The regional progress report also identifies a list of short term and long-term challenges faced by WILMAPCO. The list includes challenges such as creating alternatives to the automobile, meeting increased demand for goods movement, ensuring transportation equity, etc. The list serves as a guide for future staff efforts and time allocation over the next few years. In future versions of the regional progress report, WILMAPCO plans to include some form of a before-and-after analysis (where multi-year average data is available) as a means to further gauge project effectiveness. In addition to the regional progress report, WILMAPCO produces a CMS summary reviewing its congestion management process. Together, these documents serve as a means not only to gauge the agency's performance, but also to communicate that performance to WILMAPCO member agencies and the public. Both documents are written in a non-technical, reader-friendly format that encourages their use. For example, county zoning staff uses the CMS summary when reviewing land use plans, especially in assessing the adequacy of developer contributions for transportation improvements (e.g., intersection improvements, transit stops, sidewalks, etc.). Where a potential project is proposed for an already congested corridor, the county may be in a better position to require additional improvements of the developer. In addition to improving these types of reports and making them more accessible to stakeholders, WILMAPCO is considering other future steps. For instance, the agency recently incorporated crash data (e.g., rates, frequency) into its identification of congested corridors. WILMAPCO has developed a regional approach to reviewing the locations of areas with high crash frequencies. As crash data has become more reliable over the years, the agency expects to include it in its 2009 CMS summary. In addition, with reliable historical crash data now available, WILMAPCO has the ability to begin tracking the crash trends in the region. WILMAPCO also plans to work more closely with its State DOTs – Delaware and Maryland – to coordinate data needs for better analysis of congestion mitigation projects and their effects, both positive and negative. In short, WILMAPCO seeks to assess the true cost and benefits of transportation improvements. The performance-based approach taken by WILMAPCO provides several lessons. First, by adding an element of performance measurement and monitoring to its planning, WILMAPCO receives greater and more reliable information about the investments made by the region in its facilities and services and about the efficiency of the overall transportation system. Moreover, a performance-based approach adds to the agency's accountability in seeing that transportation investments are made wisely. Second, an integrated CMP likely leads to transportation projects that are more effective and the added realization of RTP goals and objectives. Finally, the close coordination that WILMAPCO shares with DTC is beneficial to both agencies. From the MPO perspective, it has an additional partner in the planning process. Proposed projects receive greater support. Data needs are more easily met. From the transit provider perspective, transit solutions frequently are placed ahead of roadway solutions and transit-supportive projects receive greater prioritization. Though, of course, challenges still remain for WILMAPCO. Engaging the operations community has been its biggest challenge. Operators typically view planning as 1 to 2 years out; planners consider 10 to 20 years ahead. In addition, there are the persistent hurdles of limited transit funding, growing public demands, and meeting the needs of a changing population. AMPO Transit Development Task Force. WILMAPCO and the Delaware Transit Corporation. Presentation. Blevins, Daniel S., Principal Planner, Wilmington Area Planning Council. June 23, 2008. Personal interview. Summary of the WILMAPCO Congestion Management Process. Prepared for T3 Webinar. September 18, 2007. Presentation. WILMAPCO. 2007 Regional Progress Report. January 2008. WILMAPCO. 2008 Congestion Management System Summary. Final Draft 6/7/08. WILMAPCO. 2030 Regional Transportation Plan. 2007 Update. WILMAPCO. 2030 Regional Transportation Plan. Adopted March 22, 2007.